All annotations can be displayed in the Timeline Viewer or the Interlinear Viewer. Only one of the two Viewers can be switched on at a time. The Timeline Viewer is always shown when a document is opened in ELAN. It displays the tiers and their annotations, whereby each annotation corresponds to a specific time interval. Because the display of an annotation is limited to this time interval, an annotation does not always fit in the annotation frame. A small grey square is the bottom right corner of the upper part of a annotation frame indicates that an annotation is truncated. The height of the tiers can be reduced to make more tiers visible. To do so, open Edit > Preference..., select Viewers, check Reduced Tier Height and click OK. Above the tiers, a time scale is displayed. This time-scale can be hidden by right clicking in the Timeline Viewer and clicking on Time Ruler Visible in the context menu. In the same manner it can be made visible again. During playback, a red vertical bar, the crosshair, moves through the annotations and indicates the current point in time. Normally the crosshair will start from the left if it reaches the right side of the viewer. If you right click in the Timeline Viewer and select Ticker Mode, the crosshair will stop when it reaches the center of the viewer, while the viewer itself scrolls to the left. Whenever you have selected a time interval, it will be highlighted in light blue; and whenever you have selected an annotation, this becomes the active annotation and will be highlighted in a dark blue frame. If desired the latter can also be indicated with a bold line. To activate this, right click on an annotation somewhere in the timeline viewer and check the Active Annotation Bold box in the context menu. In the Timeline Viewer you can (a) select and modify time intervals (see Section 5.7) and (b) enter annotations (see Section 5.8). The Interlinear Viewer offers an alternative perspective on the tiers and their annotations. It shows parent-child relations between annotations using vertical text alignment (interlinearization). You can enable it selecting the Show Interlinear Viewer radio button when you right-click on the tier name’s panel and select Viewer. Switching it on, will automatically switch off the Timeline Viewer. The following screenshots compare how information is displayed in the two Viewers. 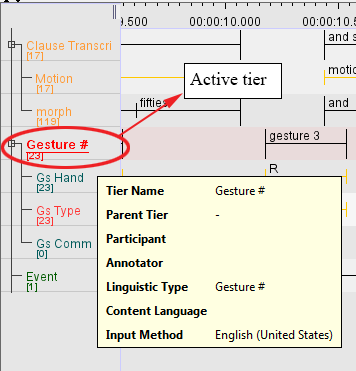 Whenever the Interlinear Viewer is switched on, it displays an annotation block (i.e., an independent, time-alignable parent annotation together with its referring annotations, see Section 5.1). To move forward/backward to the next block, click on the arrow icons at the top of the Viewer. During playback, the Viewer automatically moves forward to the next annotation block. The Interlinear Viewer differs from the Timeline Viewer in that it does not allow to modify the time interval or to enter new annotations. 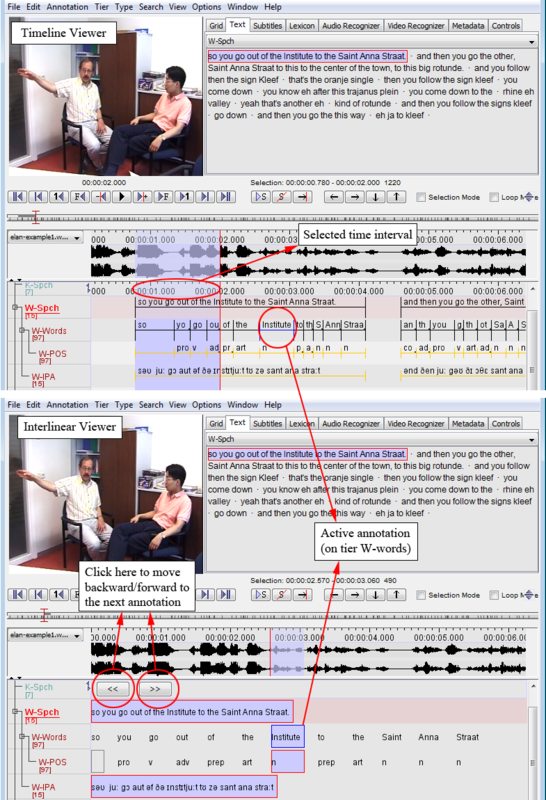 It is similar to the Timeline Viewer in that it allows to edit existing annotations. The Tier Name Panel gives an overview of the different existent tiers. Both tier names (see also Section 5.1 and Section 5.4) and tier types are defined by the user (see also Section 5.3). One of the tiers in the Tier Name Panel is the active tier (indicated by its underlining and red color), which means that new annotations will be added to this tier (when pressing ALT+ N). Double click on a tier label. Right click in the Timeline or Interlinear Viewer and choose Active Tier. To select the tiers to display (and their order) see Section 4.4.20 and Section 4.4.23. It is possible for ELAN to show the number of annotations per tier. Right click on the Tier Name Panel and select Show Number of Annotations.